Jude has spent the whole twenty one years of his life running. From what, he wasn’t quite sure. His mother tried to keep him safe; a low profile, a constant move on the horizon, a week’s pay always stashed away. She tried to instill in him that he was special somehow, though would never elaborate. He never felt different. He was so completely normal and vanilla that he wondered if it had all been in her head. But then she was murdered and all he saw was a running silhouette of a man as his mother said three final words to him. Three words that changed his whole being. Now he’s semi-settled into a big town. The college is huge and easy to blend into. It’s been three months since he had to move because ‘Biloxi’, as he calls the man who killed his mother, found him once more. Then Marley, an eighteen year old girl who is as infuriating as she is blissfully ignorant of her gorgeousness, smashes into his car with hers. Then smashes into his life as he realizes that whatever it is he has that Biloxi wants, she has it, too. And now, they’re after them both. I’ve read some of the Significance series by Shelly Crane and have enjoyed those pieces, but I will be honest here and say I was not a big fan of Smash Into You. I really wanted to love it, I wanted to love Marley and Jude, but I just couldn’t. Let me start by saying this is not a bad book! There were some great ideas and there’s a lot of potential within this world Crane created, but there was a lot left to be desired. The characters were interesting, though with more development, I feel they could have shined and given the story more depth. Marley seemed a little all over the place – at times she needed attention, at others she was self-sufficient. She was pushy, but not. I wanted to know more about her background; with only the surface of her story told, I was feeling like much was missing. Visually, I had trouble envisioning what was going on. With a little more sensory detail, this could be fixed. I loved the idea of this story, especially when more was revealed of what was actually going on. This could have been it’s own book, though. I wish there were more detail and the pacing of that part was a bit better. Overall, the story was alright. I will definitely read more Shelly Crane, as I love her Significance series. She’s a very talented writer, this just wasn’t my favorite of her books. The road trip from Minnesota to Pennsylvania and back is meant to be the final adventure before four friends go their separate ways in the fall. “My regular followers are probably aware by now that I review everything Lindy Zart releases. You can call it an addiction if you’d like, but I prefer to think of it as dedication.” I started out my most recent Zartian review with this statement, and I think I should just make it my opener for all Zart posts. Anywho, onto the review. I enjoyed Jessie’s Girl. This is a fun, 80’s-set novella filled with fun adventure and great use of era dialogue. Zart doesn’t waste any space with this one, as it is far shorter than her other books at around 30,000 words. All of the characters in the book are so exceptionally diverse in personality and looks, but somehow have a dynamic friendship with one another. The inclusion of Jessie’s new girl, Catherine Tate, throws a wrench in the core group’s plans for a road trip. The only thing I would have liked more of was visual imagery; I got an idea of what everything looked like, but I wanted more. Today’s post for the A-to-Z Challenge is brought to you by the letter J! A flight of fantasy at your fingertips… Just close your eyes and drift away. This book was a whim purchase for me when I was A.C. Moore a while back. I have a hard time turning away from a good book deal, and this little gem was sitting on the shelf begging to go home with me. Into Your Dreams is a cleverly written, visually stimulating read that keeps on giving. There is a fun build up through the Seuss-like rhymes and rhythms. It’s fun for me to read aloud, as the words throughout are new and intriguing when they roll off the tongue. The art throughout this story is vibrant and unique and suits the story well. Today’s post for the A-to-Z Challenge is brought to you by the letter I! *I received a free ARC of Twisted Sisters from Xpresso Book Tours in exchange of an honest review. Welcome to my stop on the Twisted Sisters Blog Tour! Click the link to read my review, see the rating, find out more about the author, and enter a giveaway for a $25 Amazon gift card! It comes in the mail—a beautiful invitation that promises humiliation and horror. Unless Maggie Smiley, former child celebrity and now overweight recluse, gets her courage and motivation in check, along with her health. The phone call offering fitness expert Lance Denton a chance to work with Maggie Smiley promises retribution. He messed up a lot as a punk kid on the too-fast road to stardom, and how he treated his co-star never left him. It is that—and a long list of secrets she doesn’t need to know—that has him show up at Maggie’s doorstep. My regular followers are probably aware by now that I review everything Lindy Zart releases. You can call it an addiction if you’d like, but I prefer to think of it as dedication. I always become very excited when she lets loose another new release. Probably more excited than a normal human being should… but it’s that dedication thing. Here I am – reviewing the latest. Within This Frame did not disappoint. This novel goes between past and present alternatively each chapter, sharing the stories of Maggie Smiley and Lance Denton. I was a little nervous at first because there are few stories that successfully utilize this time flip-flopping technique. I’m happy to report that Zart does it without issue and quite a bit of success. I found myself wondering what the next chapter would bring, in a way a regularly-timed story does not. What would be the next piece in the puzzle? Each chapter became another story as I was reading, building on the previous. The characters in this book were amazingly well-developed. Maggie and Lance each have their demons and secrets run rampant. There is something to be said about the structure of this story as it plays into the development of the characters within. The plot is a challenging one, as we have all battled something internal or external. We all have something that makes us second guess ourselves, feel self-conscious, or be fearful of a new day. Our inner demons don’t just affect us, they trickle down to those around us. This story was personal and relatable. Maggie and Lance let us in to their struggles, even when they closed off. Perhaps this is the editor in me, but I love Zart’s writing style. The sentence structure is varied and there are no overused phrases. I often find myself picking out the repetitive sentences and cliched statements in contemporary lit. Not in this story. This was a welcome relief from those books I’ve read lately. Another winner for Lindy Zart. And yet another one I need to have on my physical shelf. Maybe I should make my way down to one of those book fests this coming year? In case you haven’t figured out by now, I love books. Beyond love books. I breathe them in, eat them up, and bathe in their goodness. I clothe myself with their pages and dance to these page-turning rhythms. Okay, so maybe that’s a bit wordy and dramatic, but it sort of covers how much I love books. I’ve been pretty lucky along the way to be able to get to know some really talented authors. Obviously, I’m really close with Michele. Editing her books has been a dream and she’s incredible to work with. I’ve also been able to get to know Mindy Hayes, author of the Faylinn novels and the Willowhaven series. Lastly, I don’t think there has been a release of Lindy Zart‘s that I haven’t jumped on. It’s always exciting to see her new teasers for works in progress and I enjoy being one of the first to read and review her books. There are definitely others, but those are the three who stand out right now. Hopefully over the next year I will be able to create some new friendships and partnerships with other incredible authors. If you haven’t yet, be sure to check out each of the authors linked here. Their styles are diverse, with many genres and unique stories to choose from. I tend to do better with a schedule, though I have been known to review books at leisure. I enjoy hopping on a blog tour to review books, as this introduces me to books and authors I may not have read before. I like the structure of a tour, but I also enjoy the freedom of a self-driven review. I have a few self-driven reviews coming up the pipeline, but then again there are some great tours coming up too! I’ve altered my review system over the past year, but my review process has remained pretty much the same. You can view last year’s post here. As for my system – If you don’t remember, I had a pretty hefty undertaking with each review I was writing. I’d write at least a five section review, elaborating deeply on characterization, dialogue, visuals, plot, and the ending, all leading into a score. I’d add up the points out of five for each, with the highest being 25. This was simply a bit much for me. I recently changed my process to be an overhead review, touching on each part easily, but not separating each subject, and averaging each of the scores in a breakdown at the bottom. 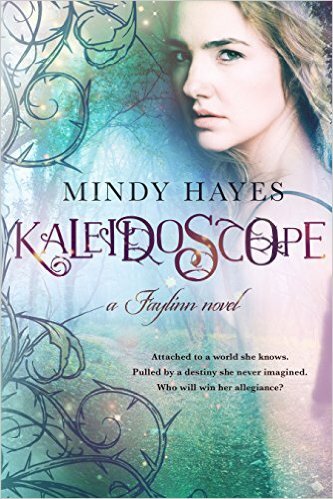 Check out my review for Mindy Hayes’ Kaleidoscope for quick reference. I like this system far more and it gives readers a much more one-stop shop. I am thankful for warm and soft chocolate chip cookies, photographs, winter clothing, and Netflix. It starts in her chest. The change Calliope doesn’t see coming. It pulses like a second heartbeat, urging her to give in to the need to be in the depths of the forest. She’s compelled to fight the pull, but the more she denies it the stronger it becomes until she finally surrenders and is pulled into a secret world of enchantment. I have been a follower of Mindy Hayes for some time now. I was introduced to her by Michele and couldn’t wait to get my hands on one of her novels. Well, I got my hands on it and then let it sit in my To Be Read pile for a bit of time. What a silly decision!! I am a sucker for fantasy novels, especially well-written ones like Kaleidoscope. Hayes pulled me in with her prologue and I was reading with bated breath until the last page. Truth be told, it took me a day to finish this book; I just couldn’t put it down. I enjoyed getting to know Calliope, the main character of this novel, and meeting her friends and family. Calliope is discovering herself and not all of these discoveries are easy for her. She’s well-developed and continues to grow through this novel, and surely into the next two. Cameron, Calliope’s best friend, is another character I loved. He’s the perfect best friend and I love the dynamic between him and Calliope. Now, Kai and Declan are fabulous. Their banter and honesty made me look forward to each time they appeared, wondering what would happen next. Hayes writes with a lot of color and description, allowing the reader to easily visualize what is happening in the story. The use of nature to drive the plot enhanced the story and became almost a character in itself. Fantasy has always been a favorite genre of mine, getting lost in a world I wish could exist beyond what I know. Hayes helped make that vision come to life on the pages of Kaleidoscope. The next two books were on my Wishlist even before I finished this one and I can’t wait to add them to my Hayes experience. Mindy is the author of the YA Fantasy Faylinn Novels, Kaleidoscope (Faylinn #1), Ember (Faylinn #2), and Luminary (Faylinn #3), as well as the Contemporary Romance Willowhaven Series, Me After You (Willowhaven #1) and Me Without You (Willowhaven #2). Currently, she’s working on the Coming of Age Romance, The Day That Saved Us. She grew up in San Diego, California exploring her interest for singing and playing the piano. Mindy first discovered her passion for reading when she had to make her first flight alone to South Carolina to visit her, then, fiancé. Her love for writing followed shortly after. Mindy and her husband have now been married for eight years and live in Summerville, South Carolina.